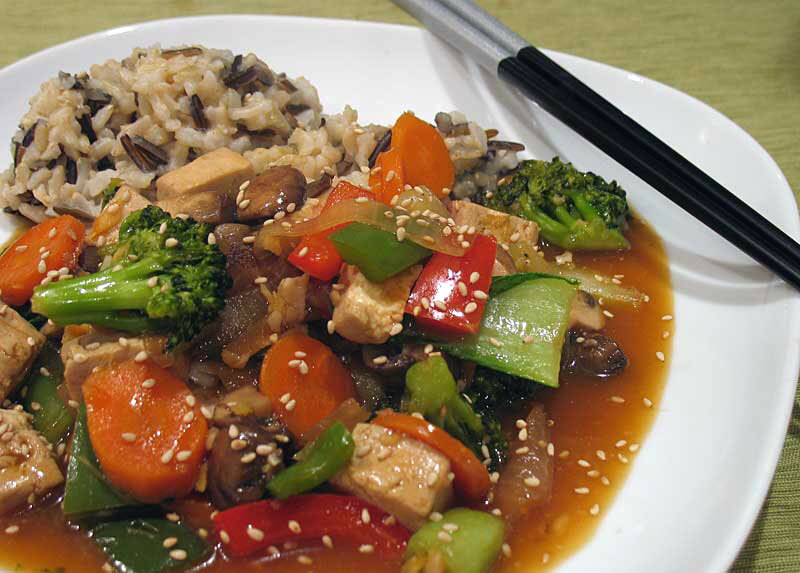 A few nights ago Lisa raided the CSA box and made this stir fry, based on one she found on Elise’s site. She changed up the vegetables a bit and cut the oil almost in half (Elise loves her oil)! Wow the sauce on this is fantastic. Yeah, and spicy! I got to use your rooster sauce. The tofu and the rice make this a lot more filling than I thought it would be. I know! I’m kind of full but I’m going to eat more anyway — it’s all veggies so I know I’ll just be hungry later on. I’m going to save the rest for my lunch. Sorry sucka — “the rest”? “The rest” is already in my belly. Whisk the glaze ingredients together in a bowl and the sauce ingredients together in a different bowl. In a third bowl, mix the garlic, ginger and 1 teaspoon of vegetable oil. Heat 1 Tbsp of vegetable oil in a large, stick-free skillet on medium-high heat. Add mushrooms, onion, and tofu, and cook, without stirring, until browned on one side, about 2 to 3 minutes. Reduce heat to medium and use tongs to turn the mushrooms to brown the other side. When mushrooms are browned and tender, about 5 minutes, increase the heat to medium-high and add the glaze. Cook, stirring to coat the mushrooms, 1 to 2 minutes more. Transfer mushrooms to a large bowl. Wipe out skillet with a paper towel. Heat a teaspoon of vegetable oil in the skillet on medium-high heat until the pan begins to smoke. Add carrots and broccoli and cook, stirring occasionally, until they begin to brown, 1 to 2 minutes. Add 1/2 cup broth and cover skillet. Cook until carrots are tender, 2 to 3 minutes. Uncover and cook until liquid evaporates. Transfer carrots to bowl with mushrooms. Wipe skillet clean with paper towel. Heat a teaspoon of vegetable oil in the skillet on medium high heat until it begins to smoke. Add the bell pepper and bok choy stems and cook, stirring occasionally, until the vegetables begin to brown and soften, about 1 to 2 minutes. Add leafy greens and cook for a minute further. Push the veggies to the side of the pan and add the garlic-ginger mixture in the clearing. Cook 15 seconds, until fragrant, and then mix in with the other vegetables. Add all the vegetables back into the pan (mushrooms, carrots, etc.). Add the sauce to the pan. Mix well and cook, stirring, until the sauce has thickened and all the vegetables are coated with the sauce, about 2 to 3 minutes. Transfer to a serving platter. Sprinkle with toasted sesame seeds if desired. Serve immediately with rice. This entry was posted on Saturday, March 15th, 2008 at 3:35 pm	and is filed under Main Dishes. You can follow any responses to this entry through the RSS 2.0 feed. You can leave a response, or trackback from your own site.